With this in mind, we thought we’d talk a little bit about Innovative Finance ISAs today for those who might want more information about them. What Are Innovative Finance ISAs? Innovative Finance ISAs were introduced by the Government in 2016. They are a way for investors to get involved with peer to peer lending while at the same time enjoying the benefits of investing via an ISA. Since then many well known companies have launched this kind of ISA and they are growing in popularity. How Do Innovative Finance ISAs work? When you invest your money via an IFISA, the company you invest with will lend out your cash on your behalf. You will then, in turn, earn interest on those loans. While there is some risk involved as with any investment, most IFISA providers put in place ways to mitigate this risk. One well known peer to peer lender RateSetter*, for example, have something called a provision fund which is designed to protect investors should a borrower default on a loan. They also take care to only lend money out to worthy borrowers. This is slightly different to the approach taken by another popular IFISA provider easyMoney*. easyMoney don’t lend to everyday borrowers. Instead, they lend out to property professionals who are looking to finance a property purchase. To help protect your investment, easyMoney take security on the property that is bought. To learn more about the IFISA providers mentioned here check out the following reviews on our blog. Why Choose an Innovative Finance ISA? The main attraction of IFISAs are the increased potential rates of return on offer when compared with simply placing your savings into a Cash ISA. As we mentioned earlier, IFISAs are investment ISAs. This means that your capital is at risk in a way that it wouldn’t be in a savings account. With savings rates remaining so low, though, many savers are starting to think a little more outside the box in order to achieve a better return on their cash. How Much Can You Invest in an IFISA? If you are liking the sound of Innovative Finance ISAs then you might be wondering how much you can invest in one? The answer to this depends on whether you hold other kinds of ISAs and have already contributed to them in the current tax year. If you haven’t yet made any other ISA contributions, then you can invest up to £20,000 tax free into an IFISA. You Can Hold Other Types of ISA Too! Don’t forget you can also invest into a different kind of ISA too, as long as the total contributions don’t exceed £20,000. This means you could invest say £5000 in a Cash ISA, £5000 in a Stocks and Shares ISA and then invest the remaining £10,000 into an IFISA. This is just an example as you can spread it out however you like. Of course, we shouldn’t forget about the Lifetime ISA either if it is suitable for your circumstances. 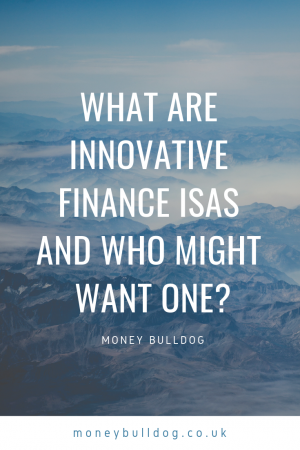 We hope this brief description of Innovative Finance ISAs has given you a better understanding of what they are and how they work. For a more in-depth look at IFISAs be sure to check out the reviews mentioned earlier in this post. They will give you a much better idea of what’s on offer, including the current proposed rates of interest. We’ve also secured a special £100 bonus deal for our readers with RateSetter, so be sure to look out for that.